Enjoy the video and photos! 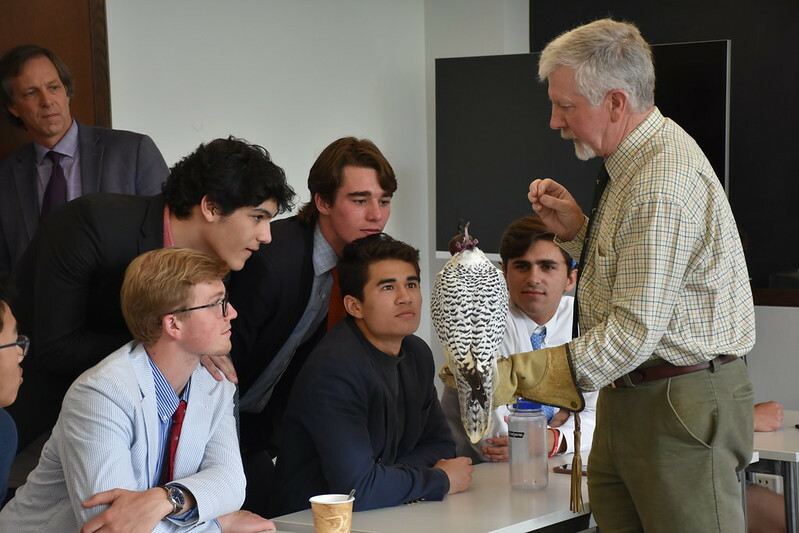 Mr. Campbell ’85 and his Medieval Literature students recently welcomed back master falconer Jonathan Shaw. Mr. Shaw brought two birds with him—a Harris’s Hawk named “BB8” (brown) and an Artic Gyr named “Gyronimo” (white)—whom students were able to hold, as he lectured on falconry and its significance to daily existence in the Middle Ages. Mr. Shaw shared much insight about the technical aspects of hunting with birds, as well as the social status associated with different types of birds of prey. Mr. Shaw also related the influence of hawking terminology on the English language, from “hoodwinked” to “having a feather in one’s cap.” Enjoy the video and photos!